Drone tour of Tower poppies Jump to media player A remote controlled drone has captured close-up images of the Tower of London ceramic poppy installation. UK falls silent for two minutes Jump to media player A two-minute silence has been held around the UK to mark the anniversary of the World War One armistice. Ceramic poppies attract large crowds Jump to media player Thousands of people visiting an art installation at the Tower of London leads to long queues and travel disruption. 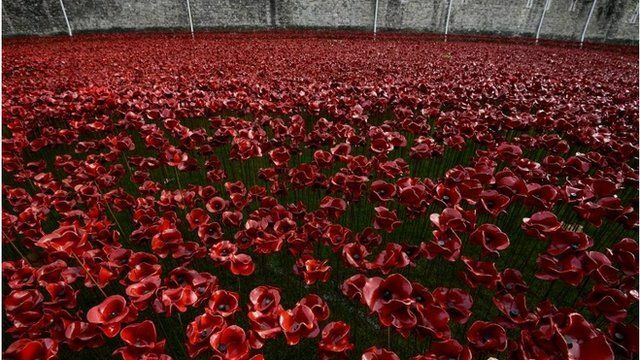 What should happen to Tower poppies? Jump to media player A key part of the World War One poppy display at the Tower of London is to stay in place until the end of November, Prime Minister David Cameron has said. A remote controlled drone has captured close-up images of the ceramic poppy installation at the Tower of London. The footage was released by Historic Royal Palaces, as part of the Armistice Day commemorations. It gives an aerial view of the 888,264 poppies that encircle the tower. They have been viewed by almost five million people since the installation was launched four months ago.